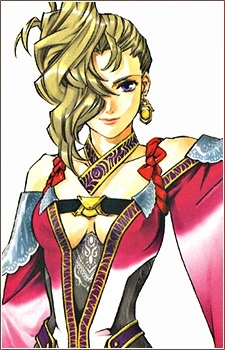 Sialeeds is Queen Arshtat&#039;s younger sister, and thus the Prince and Lymsleia&#039;s aunt as well as Haswar&#039;s cousin. Like Haswar, she has renounced her claim to the throne, which resulted also in cancelling her engagement to Gizel Godwin. Sialeeds, not tied down by politics at Sol-Falena, frequently travels with the Prince and instructs him and Lymsleia on the nation. She is considered by both Haswar and Arsthat a canny politician, and she detests the greedy nobles dividing Falena. With no claim to the throne, Sialeeds lived a life with a carefree attitude. She was known to drink, is quick to hold parties, and to sleep well into the day, punching out anyone who dares to wake her before she was ready. However, she is known to be quite skilled in the use of magic runes and with thrown chakram, as well as being having a sharp intellect and instinct for politics. When she accompanies the Prince to Lordlake, Sialeeds is least affected by the tragedy, knowing full well what exactly happened to the city. She and the Prince travel to Stormfist in preparation for Lymsleia&#039;s Sacred Games and become suspicious of the Godwins, who intend to sabotage candidates of the games in their favour. Though Sialeeds is able to discern that plotting allowed Gizel to win and presents her suspicions to her sister, she lacks solid evidence and suggests that Ferid interrogate Zegai, the disqualified Barows champion. Subsequently, Sialeeds joins the Prince in accompanying Lymsleia during a purification rite; she ends up helping Haswar quietly return two Raftfleet members attempting to steal gold dust from Lunas and introducing her nephew to Admiral Raja. Sialeeds, the Prince, and Lyon all survive the Godwins&#039; coup, but discover that the Queen and Ferid are dead and that they must flee without Lymsleia. After finding sanctuary in Lunas, Haswar advises them to seek shelter with the Barows, who are only ones with the enough military might to protect them from the Godwins. However, Sialeeds comes to suspect Lord Barows of acting in his own interests and instead believes they should approach Raftfleet for help. She reluctantly has the Prince accept Lucretia Merces as his tactician to dispose of Lord Barows and his allied Armes forces. They recover the Dawn Rune from Lord Barows soon after. During the Queen&#039;s Campaign, Sialeeds unexpectedly betrays the Prince by returning Lymsleia to the palace, but shows no inclination of following Gizel. She comes to possess the Twilight Rune soon afterwards and uses it power against the Godwins, the Barows, and the Prince, who is able to counter his aunt with the Dawn Rune. She confronts him one last time during the siege of Sol-Falena while attempting to destroy a dam to protect his army from the Sun Rune. She and the Prince end up using the combined power of their runes to stop the Sun Rune. As Sialeeds dies, she passes the Twilight Rune to Lyon and converses with Lucretia Merces about the Prince and his abilities. Gizel later reveals upon his death, that Sialeeds&#039; true intention had been to rid Falena of the Barows and Godwin factions so that the country would be left in the hands of her niece and nephew. Her body is buried in the Prince&#039;s Army Castle. Regardless of her true motives, the fact that she betrayed the Prince prevented her from being buried in the Royal Cemetery of the Sun Palace in Sol-Falena. She is last seen with the spirits of Arshtat and Ferid, congratulating the Prince wordlessly.